When you have just a bird’s-eye view of the catastrophes that laid siege to Japan about 16 months ago — earthquake, tsunami, nuclear disaster — it could seem impossible to find a loving, restorative God in the midst of it all. But if you get up close, on the inside, you will find incredible power and renewal — you will see Him working all things together for the good of those who love Him and are called according to His purpose. Even in such destruction, He uses the local church to heal, restore, and build His Kingdom. Over the past year, DNA national organization Friends with the Voiceless, Intl. (FVI) has been instrumental in this work. A 2006 Gallup poll found that Christianity is the fastest-growing faith among Japanese youth. Japan is thirsty for the gospel, and FVI is helping pave the way for its people to receive it. As many doctors, nurses and pastors fled the district of Fukishima, the area most damaged by the nuclear disaster, a few stayed — one pastor explaining that he dreamed he saw Jesus walking with His cross toward the power plant. Aside from physical destruction, in Fukushima, families have been torn apart as many husbands have gone to find work elsewhere. Divorce has skyrocketed. In this country where 29 percent of youth describe themselves as “very lonely” and suicide rates are high, FVI helps unite and equip the Church to bear the hope of Christ. Since the nuclear disaster, FVI staff members have made 15 trips to the province, conducting “Fukushima Future Forums” with dozens of pastors in attendance. 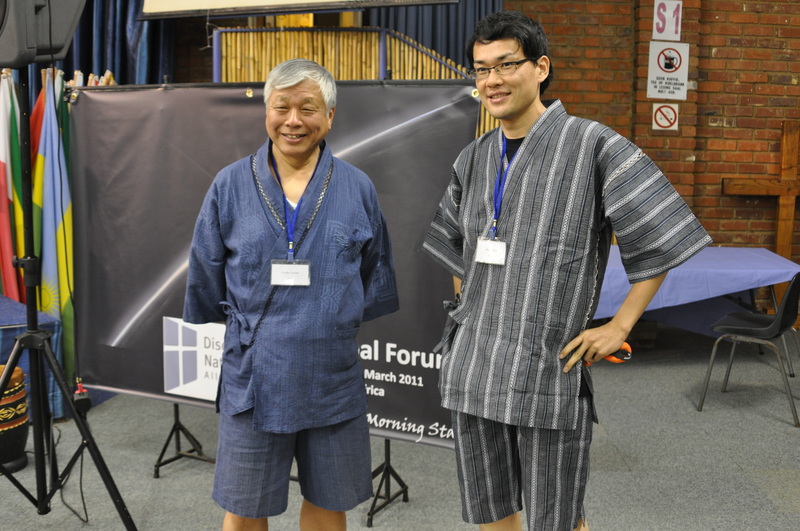 In March 2012, one of these Forums geared for young Japanese Christian leaders had 50 attendees — half from Fukushima. At these events, Christian leaders are invited to recommit their lives to the Lord and commit to rebuilding Fukushima from a biblical worldview. As a result, while many people continued to flee the province, one Forum participant moved in and planted a church. Another started an out-of-the box “listening ministry,” and a network of young participants formed to practically serve Fukushima residents. Also at the Forum last March was a pastor from Ukraine who ministered to survivors of the 1986 Chernobyl disaster. He offered great encouragement and invited Fukushima pastors to come to Ukraine and meet other Christian leaders with similar experience. That visit is planned for October 2012. (From left) Eisuke Kanda and Shun Jinnai co-lead Friends with the Voiceless, the DNA national network in Japan. To contact them, e-mail info@disciplenations.org. Praise God! He is still active in midst of disaster. Glad to see people are smiling. Praying that God continue over His blessings to people in Fukushima, I hope they will know they are not alone, God be with them, and come to understand God’s love and mercy. I was in Japan in 1982 under Eisuke Kandas leadership with Campus Crusade. After Fukushima disaster, I told my husband, “I bet if I look up Eisuke Kanda he’ll be right in the middle of the disaster helping….” Need I say more? This is great to hear, Annette! Thank you for sharing. We thank God for Eisuke and his servant leadership in Japan.